The forest is familiar to some and for others this is the first step into a new and unknown environment. A permit is generally required to enter one of our production forests. Part of the permitting process is a formal forest induction. During the induction process information is given on safety policy and culture, personal protective equipment (PPE), (what to have and when to put it on), access routes, hazards and risks along the way and how these can change e.g. with weather etc. The important matter of communication, along with the plans, roles, and responsibilities when PCBU’s need to work together are all covered in this process. 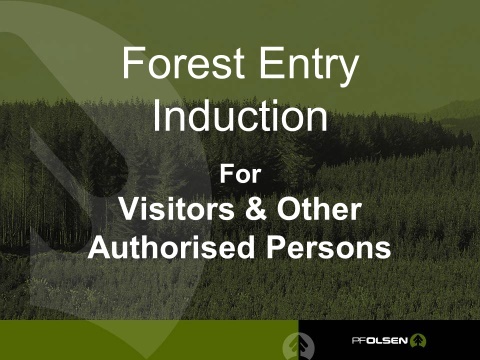 At the PF Olsen office in Rotorua the Safety Induction for Visitors and Service Providers takes place every Friday morning and we have literally inducted thousands of people, from all walks of life and business over the years. Some of these have included mechanics in overalls, retirees who manage walking groups, scientists, environmentalists, pest controllers and organisers of adventure sports events. While usually the induction room is full of people, in recent times we have also trialled inducting some visitors over the internet via the communications programme known as go-to-meeting. The induction usually leaves some wide-eyed – especially when they are shown some of the information on driving and obeying road signage and the risks and hazards. Going over accidents that have occurred in forests in the past can be very sobering, however it is in the interests of safety that they are shown. Also discussed are the less known risks such as chain shot, a significant hazard on some harvesting worksites where a chain can break sending a link hurtling through the air at the speed of a bullet – just another reason to be clear on where not to go. When the induction is over some linger, they sit back in their chairs and swap stories about the way their business approaches certain hazards. Then as everyone leaves, the paperwork is taken care of, the hallway quietens down, and it’s all over for another week. Receiving a permit is just the start – applying good practice, when in a forest, is what really counts.